Special offers’ reservations for low & mid season are required to pre – pay the full amount in order to confirm the booking. Cancellation policy remains the same for those reservations as well. We do not charge in advance a damage deposit. If a guest is coming from an agency, already charging for one, we comply with that policy. As per our own damage policy, we would never charge our guest for something minor, such as a water glass or a bent spoon. In case of a significant damage, we will contact a local technician to arrive on site and assess the damage. By significant damage we refer to damages such as, a broken window glass, a broken piece of furniture, an electrical device and so on. The technician will provide the repair or replacement cost, which our guest can pay directly to the technician in cash, upon completion of the repair or replacement. In case our guest would like to pay via credit card and the technician does not have the ability (many do), we would be happy to make the charge and transfer the amount to the technician. Our guest will receive a valid & official receipt from the technician. We always seek to provide the easiest and most economic solution in case of an accidental damage, via transparency and communication with our guests. 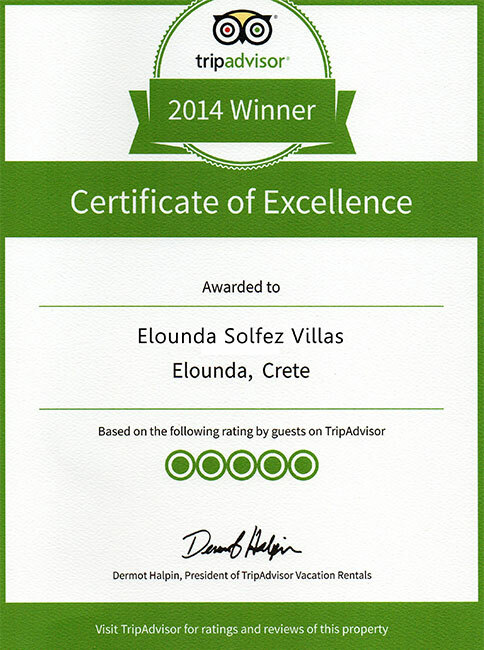 NOTE: Elounda Solfez Villas maintain the right to change the above terms, without prior notice.